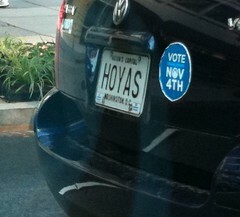 I saw this car yesterday and traffic, and immediately noticed that the plate said “HOYAS.” But then I noticed that it’s a black-and-white DC plate, embossed with a die in an older style, and got curious. A vanity plate like “HOYAS” is kind of like getting your first name as a Gmail username- it’s got early-adopter cred like crazy, and you do whatever you have to to to renew it and make sure you keep it, dammit. So over dinner last night, Tom and I got curious and wondered exactly how old this plate was. DCPlates.net gave us the answer: This particular style of black and white baseplate, with the “Nation’s Capital” slogan on top and “Washington, D.C.” on the bottom, came into use starting in 1968. It was issued numerically until February 1974, when it was replaced with the first red, white, and blue design, but was still the standard plate for vanity plates until 1978. Which means this plate is older than I am. Awesome. That’s some dedication, right there. And speaking of dedication, I’ve got to credit DCPlates for being pretty much the most thorough example of niche DC nerdery I’ve ever seen. Kudos to you guys. Notice how all that snow is piled on top of this person’s car? Don’t be like that. When you can get out and drive, be sure to clean the snow off your entire car. Two things can result from this type of halfway done snow removal. First, big chunks of ice and snow can fall from your car and into traffic. Annoying, to be sure, and likely to make someone swerve. Maybe not the best reaction, but certainly an understandable one. Second, if the snow is loose and powdery, it can blow off in traffic and blind other drivers. That’s generally bad too. On top of this, you will just look like an idiot driving around like that. You are right, it’s not as bad as the even bigger idiots who neglect to clean the snow from all their windows (yes, the back one is important too, people), but still – are people really that lazy? A coworker made the excuse to me that she could not reach the top of her car. I told her she had a size of car to size of body ratio imbalance. If you can’t clean the car off, you shouldn’t be allowed to drive it. Some day soon, you might power a streetlight simply by driving under it. 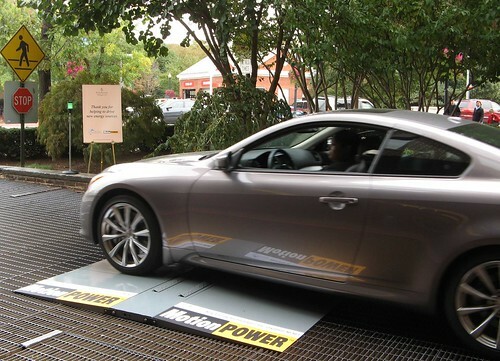 The technology that could make that happen was tested yesterday at the entrance to the Four Seasons Hotel in Georgetown, with a special speed bump laid out in the driveway. Called MotionPower, this first-of-its-kind energy harvester will convert a car’s motion into electricity. 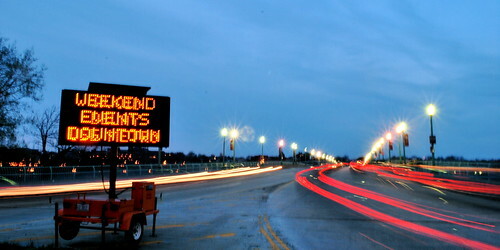 It’s meant for areas where people are slowing down, such as intersections, toll booths, garages, and the like. Here’s how it works. Metal flaps in the roadway point up diagonally, with the lifted end farthest from oncoming cars. When a car rolls over them, they flatten down — and capture kinetic energy that otherwise would be wasted as brake heat. The side benefit? It helps slow vehicles, and causes less wear and tear on the car, said Meetesh V. Patel, President and CEO of the Maryland-based company that developed the system, New Energy Technologies, Inc.